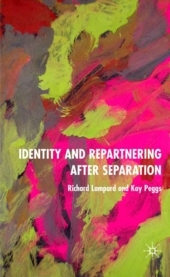 This page provides information (for the benefit of our interviewees and others who may be interested) relating to our book Identity and Repartnering after Separation, which was published by Palgrave Macmillan in July 2007. As we acknowledge in the book, our research would not have been possible without the help of all our interviewees, so, once again, we would like to thank them very much for their participation. Richard Lampard & Kay Peggs. P.S. If you are one of our interviewees and have changed your address, then do let us know your new address if you would like us to update you about our research in the future (e.g. if a paperback version of the book is published). We have donated a copy of the book to the Coventry Central Library (in Smithford Way in the city centre). To ensure its availability (i.e. as a reference item) it is to be held within the Local Studies Collection (which will relocate in 2008 to the new History centre attached to the Herbert Art Gallery and Museum in Jordan Well, also in the city centre). Copies will also be stocked by the University Library at the University of Warwick (although they may be out on loan); members of the public may use the Library up to three times in an academic year on proof of their identity or through the Inspire scheme (see http://www.inspire.gov.uk/). In addition, a copy or copies are likely to be in stock in the Warwick University Bookshop. The book is currently only available in hardback at a cost of £45 (we are hoping that it sells sufficiently well to come out in paperback at some point in the future); a bookshop should be able to order it for you, or it is currently eligible for free delivery if purchased via Amazon (http://www.amazon.co.uk/). To contact a member of staff, please use the staff directory.